I have a few questions about a crop I am growing this year for the first time. Why are collards (collard greens) unknown in the UK and Ireland? Why have I never eaten them? (well that is related to the first question) Why didn’t I realise this a ‘superfood’? Dealing with the last first, I am not a fan of the whole ‘superfood’ thing because most of the foods that are supposed to have wonderful qualities have to be eaten in such large amounts that to be healthy and get the amazing benefits of them all we would have to be obese. 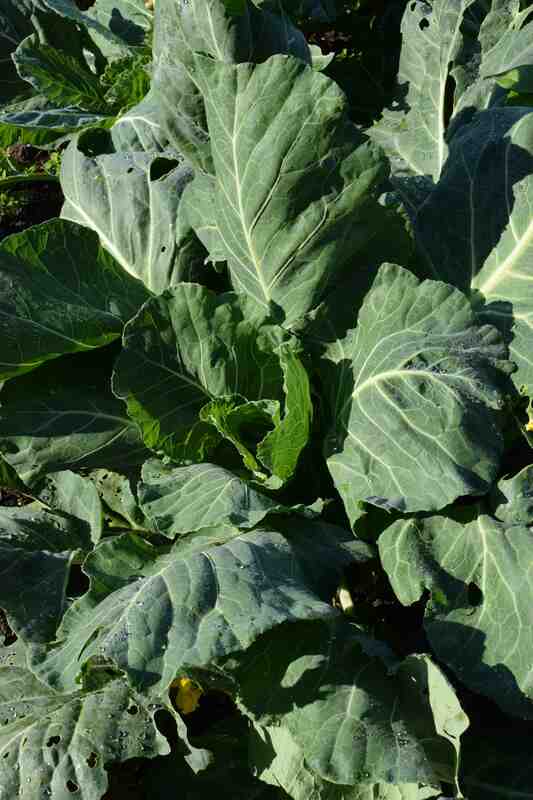 But collards seem to have all the health benefits of calabrese and other leafy brassicas and perhaps even more. Looking up the nutrient profile of collards is interesting. Just 49cals, 5g fibre and 4g protein but also, of your RDAs, Vit A 308%, Folate 44%, Vit c 58% and Vit K 1000% plus some B vits and Omega 3 and minerals. So why is collards unknown in the UK? It is a vegetable that is associated with the southern states of the USA but it is supposed to tolerate some frost. I assume that heading cabbages are tricky to grow in warm climates and so in those areas they had to grow collards which, because they are large and leafy and not as ‘perfect’ looking as cabbages, are regarded as inferior by us cabbage eaters. They would also be less easy to market because the loose leaves are picked and eaten and they would be tricky to ship in good condition compared to hearting cabbage that has a long shelf life. Anyway, this spring I grew some ‘Vates’ collards from Baker Creek Heirloom Seeds * and they have done well. I sowed them in late March and planted them out 60cm apart in early May. Apparently they can also be grown sown direct and harvested as young plans and I think I will sow some soon in this way to see how they get on. My poor plants suffered a bit after cold-dry and then hot- dry weather but are now leaping along. 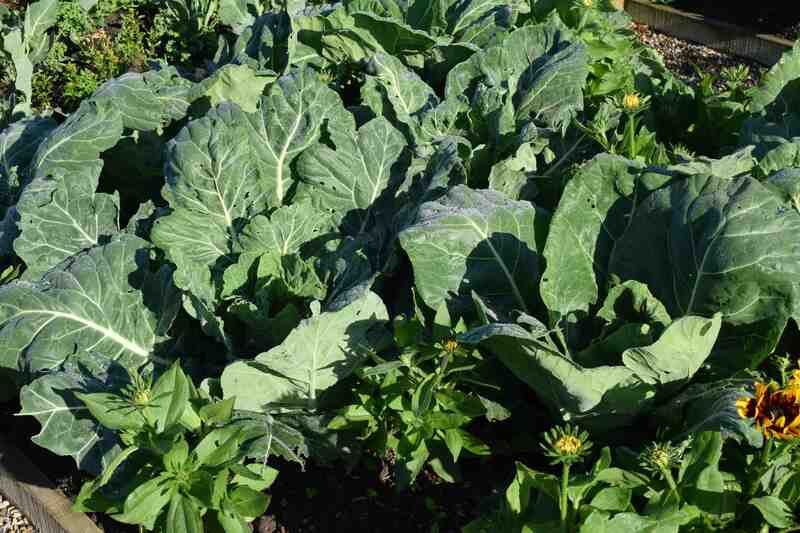 Collards are usually thought of as an autumn and winter crop but I will pick some leaves to try very soon now the plants are growing well. Of course, these plants will suffer from all the usual ailments such as mealy aphids and caterpillars but, so far, they are pretty clean. And having an open-centred habit they should be easier to pick over than cabbages. ‘Vates’ collards dates back to the 1950s when it was introduced as a dwarf variety – we will have to see how big it eventually grows. Collards are a form of Brassica oleracea, the wild cabbage and must have been taken to the New World with settlers from Europe and maintained for centuries. Or did they take cabbage and the settlers developed collards from these? That would explain why this ‘primitive’ cabbage is not grown in Europe. Or is it grown in mainland Europe under a different name? So many questions! The main one I guess is what it tastes like. I guess it is cabbagey. Will they taste better after the sweetening effect of frost? I had better get the pot out and find out I suppose. I’m looking forward to see if you get any answers! Do share if it isn’t through this medium. . . .
No answers yet though I have eaten it now. I was very virtuous and had it steamed and it was like tough cabbage! And I would not be able to eat 190g! I think I need to cook it longer next time and add equal amounts of butter! Unfortunately it tastes healthy too!